After another great weekend, I exhausted all of my fabulous outfits…. I decided I needed something new. With some new materials and whatever I had lying around, I fashioned up the perfect accessory! 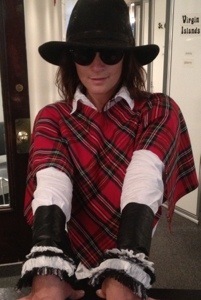 Layering rows of pulled boucle tweed, and pleated silk chiffon I made some leather cuffs. Using a beautiful soft lamb skin black leather, I created flexible and versatile accessory that can be worn with a number of garments. The Finished product…..and some of the tools that make it happen! 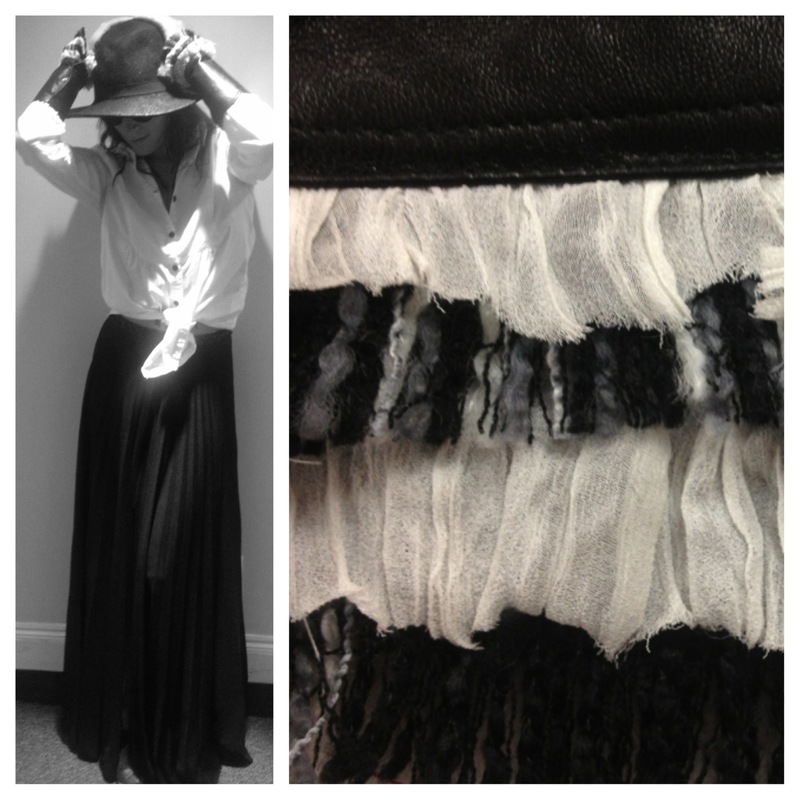 This fab black and white multi textural ensemble needed a little pop of color…. 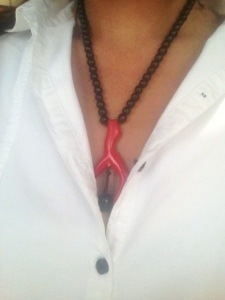 I thought this little red coral number was perfect. This really made for a fun cool summer day outfit. Class started this morning at 9am….by the time we were out at 4:30, the beautiful sunny day we started with had completely deteriorated to a grey, wet, rainy day. My first thought was of course, What the heck was I supposed to wear now?!?! Would I risk a possible wet T-shirt scenario as I ran down Newbury st? Or would I improvise and add a little something to my outfit? 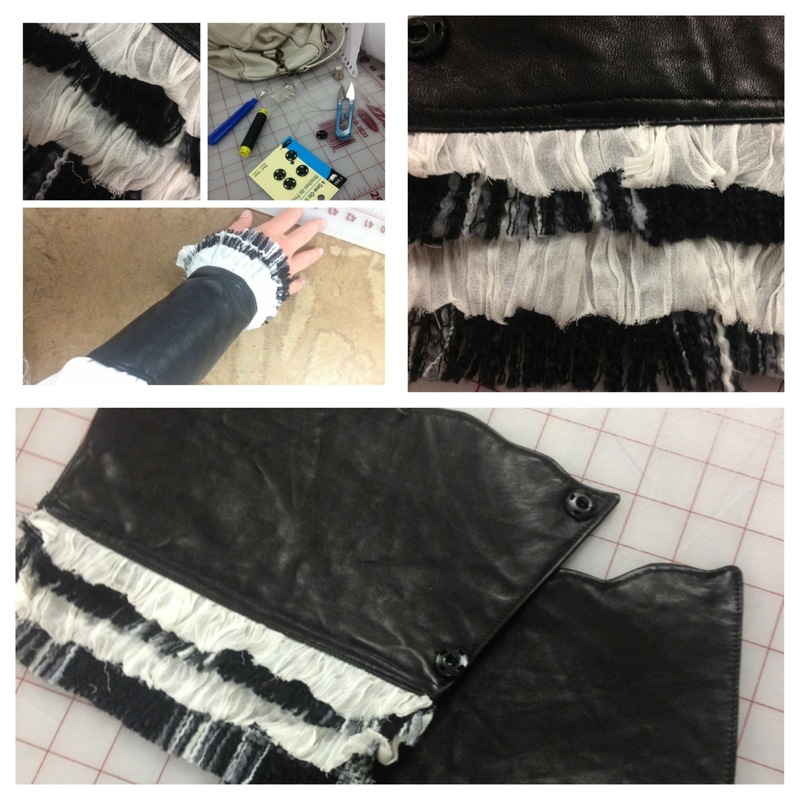 Luckily, I was at The School of Fashion Design; the perfect place to whip something up quickly. I found this fun tartan in a pile of donated fabrics. I cut a square yard, folded it on bias, cut a little triangle for my head to pop through and voila! Here’s my makeshift Scottish style rain poncho. For a quick fix, I thought this little poncho not only went with my current ensemble, but really brought it to the next level. I was quite pleased with it. I worked my local runway (Newbury st) as I made my way back to Beacon Hill. Nearing the park I felt the usual gravitational pull towards all of the greatest high end shops: Cartier, Dorfman Jewlers, Georgio Armani, Burbury, and…. Ch- wait, what? I couldn’t believe my eyes! Could it really be true?! The Window of one of the most prestigious Boutiques in Boston was featuring outfits similar to mine….Here’s their Scottish fashion story. Amaaazing! 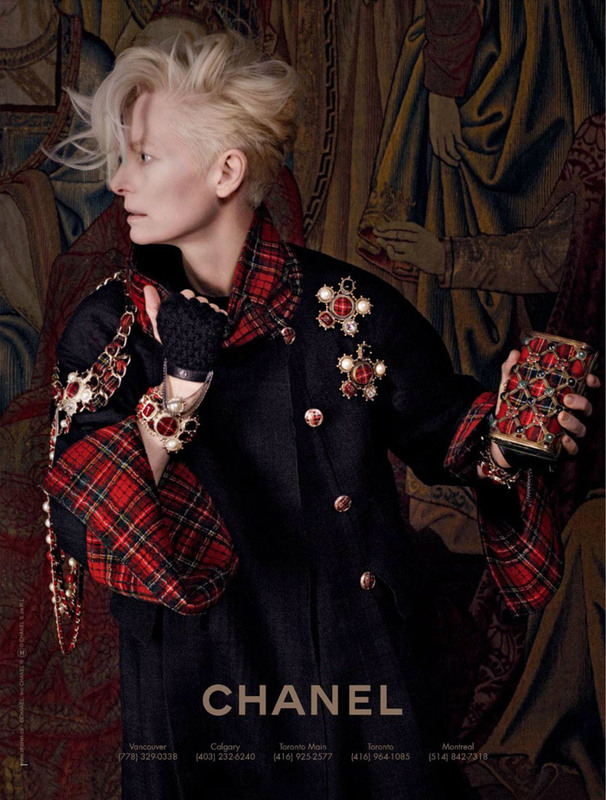 For one brief moment I felt I was on the same wavelength as Karl Lagerfeld….or at least on the same stylish planet! Either way, I’ll definitely chalk it up as a fashion Victory. With excitement, I ran in to the swanky boutique and asked if they needed a live model in their display window. With a twirl and a few sassy poses I showed off my outfit. They had a good giggle over that. 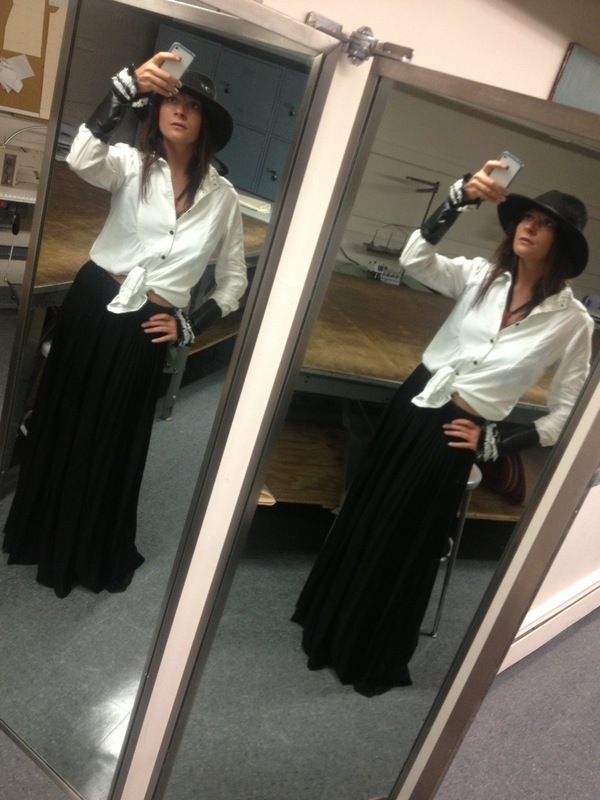 They loved my outfit…especially the leather cuffs!